Quick breads such as this one are great to have on hand for mid-day snacks or unexpected guests. I also always have a quick bread in my freezer that I can pull out for breakfast when we have overnight guests. 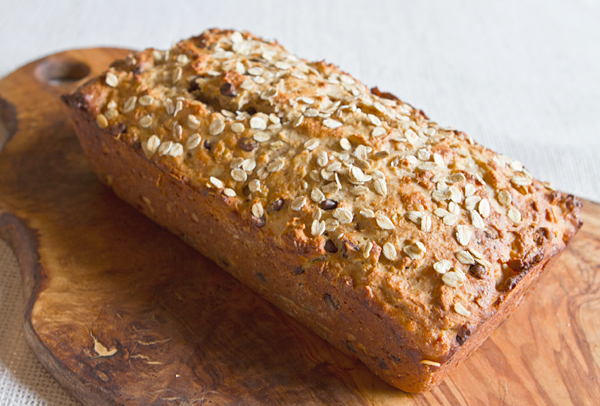 It has been well known for many years that oats are healthy for us, and I often add oats into my baking. I find using whole wheat pastry flour creates a more tender crumb in my baking, and I substituted heart healthy olive oil and fat free Greek yogurt for the butter originally called for in the recipe. Fat free yogurt and olive oil are used to replace much of the butter used in the original recipe creating a lower fat version. 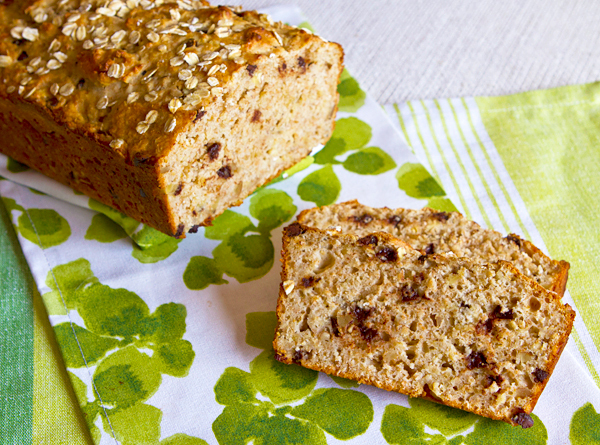 A moist healthy quick bread that would be great at breakfast or throughout the day. Preheat the oven to 375 degrees F. and lightly grease a 9 x 5 inch loaf pan. In one bowl, mix together the flours, flax seeds, baking powder and soda, and salt. In another bowl, mix together the oats, yogurt, egg, and honey and let sit 5 minutes. Stir the milk into the yogurt mixture, then add this to the flour mixture. Stir just until blended but do not over mix. Add the chocolate chips and then pour the batter into the prepared loaf pan. Sprinkle the 2 tablespoons of oats on top, then bake for about 40 to 45 minutes, or until a cake tester inserted into the center comes out clean. Let stand on a rack for 15 minutes then loosen edges with a knife. Turn the loaf out onto a rack and finish cooling to room temperature before slicing.